These are the exceptional folk that help keep the wheels turning and ensure that everything runs smoothly for our company and for our customers. At 211 degrees, water is hot. 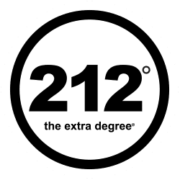 At 212 degrees, it boils. And with boiling water, comes steam. And steam can power a locomotive. One extra degree... makes all the difference. And, the one extra degree of effort in business and in life... separates the good from the great! And we want to be great!